According to all reports, Venezuela is gripped by rolling blackouts, racing inflation, homicide rates that make it the world’s second most murderous country and shortages of basic goods and medicines. The opposition parties are attempting to impeach and remove from office Nicolas Maduro, the Chavista leader, who took over from Hugo Chavez when he died in 2013 and who then managed to win narrowly the last presidential election. The opposition tactic appears to be the same as that adopted successfully in Brazil by the right-wing parties in getting Workers Party leader, Dilma Rouseff, out of the presidency. Across South America, centre-left social democratic governments that have been in office during the great commodity price boom since the early 2000s have lost power as oil and other raw material prices plummeted due to the drop in global demand as the world economy entered its long depression after the Great Recession. Both neo-liberal and Keynesian policies adopted in Argentina, Brazil and Venezuela have miserably failed to avoid severe economic recession. Over two years ago, I wrote on this blog that there was a significant risk that the ‘Chavista revolution’ would not survive the death of Hugo Chavez. As I pointed out then, Venezuela’s economic fortunes have always been tied to world oil prices. 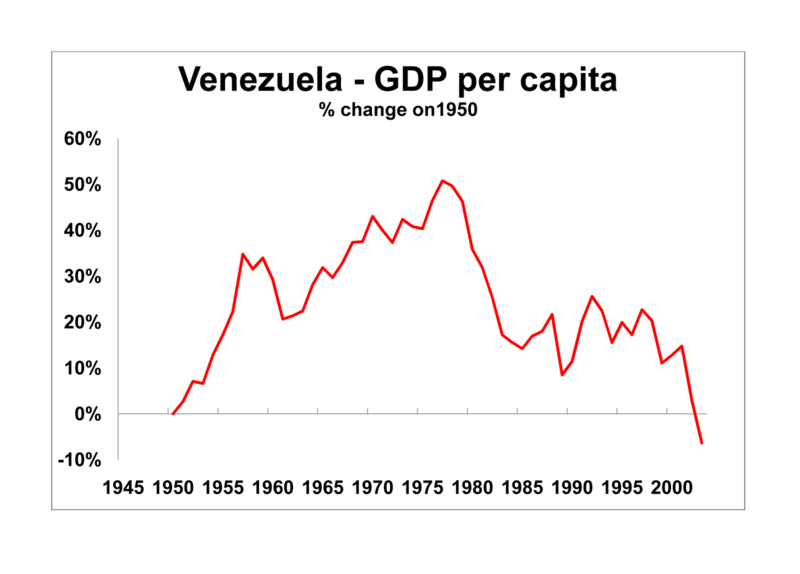 When petroleum prices began to fall in the mid-1980s, Venezuela’s GDP per head, a reasonable measure of average living standards, started to fall sharply from 50% above 1950 levels to just 10%. The subsequent crisis in emerging market debt that erupted in the late 1990s, as in Argentina, led to a further fall, so that living standards by the early 2000s were below that of 1950 – a great example of the success of the market economy in Venezuela before Chavez came to power! The collapse in GDP growth coincided, not surprisingly, with a sharp fall in the profitability of Venezuelan capital (oil industry mainly). In 1989, the then president who had won with a campaign against the IMF, reversed his mandate and said that he no choice but to submit to its dictates. He announced a plan to abolish food and fuel subsidies, increase gas prices, privatize state industries and cut spending on health care and education. Profitability was driven up, but only modestly. And Venezuelan capitalism continued to fail. When Chavez came to power, he promised broad reforms, constitutional change and nationalization of key industries under his so-called Bolivarian Revolution. Chavez’s programmes, aimed at helping the poor, included free health care, subsidised food and land reform. This succeeded in decreasing poverty levels by 30% between 1995 and 2005, mostly due to an increase in the real per capita income. Extreme poverty diminished from 32% to 19% of the population. A recent IMF report (sdn1208rev) showed, in a world of rising inequality of incomes and wealth, that there was one country that has become more equal over the last 20 years – Venezuela. And all that improvement was under the presidency of Chavez, with the gini coefficient of inequality falling from 45.4% in 2005 to 36.3% now. But Chavez was lucky. He took power just as the commodity price boom and oil prices rose to a peak. 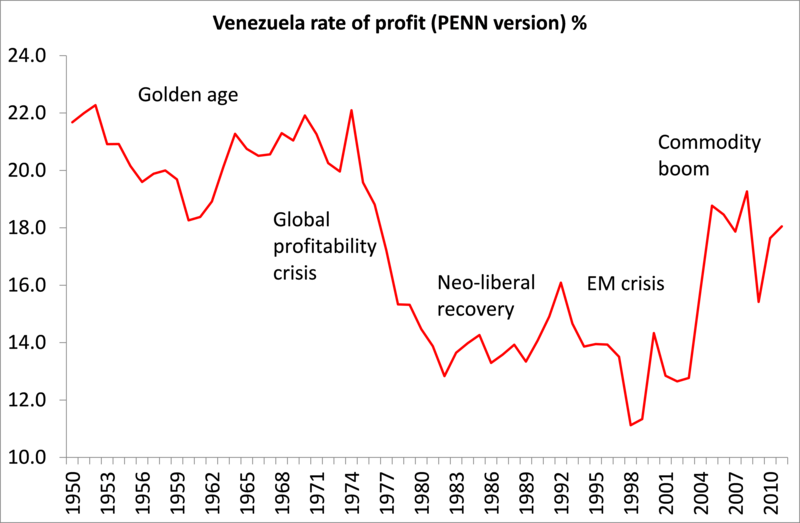 Venezuelan capital gained with a significant rise in profitability(see graph), and because the commodity boom continued for a while longer despite the Great Recession (because China kept on growing), economic growth and profitability stayed up. Oil accounts for more than 30% of Venezuela’s GDP, approximately 90% of exports and 50% of fiscal income. With high oil prices, Chávez was able to pour money into social programmes and engage in a burst of petro-diplomacy – subsidising like-minded governments not only in Cuba but also Bolivia and Nicaragua. But in the last few years, the oil price has plummeted, along with other commodity prices. The world economy has slowed into a low-growth stagnation, while China, the major consumer of energy and other commodity exports, has reduced purchases dramatically. Brazil, Argentina and Venezuela have taken the biggest hits, and with that, their ‘leftist’ governments can no longer deliver for the majority. Venezuela’s currency, the bolivar, had to be devalued in order to sustain its dollar-based oil exports. Inflation spiralled way more than in other Latin American countries. That hit the savings of the middle-class, in particular. As a result, significant opposition to Chavismo grew, even among relatively lower middle-class strata. Government spending stopped, living standards fell (again) and social problems (especially crime) began to erupt. In other words, you have to do what the markets says: the price is the price. That is true only if the capitalist mode of production and the law of value dominates and is allowed to. And it did and still does in Venezuela, despite the Chavista ‘revolution’. The majority of industry and finance is still in private hands and the foreign capital still plays a powerful role. State ownership of the oil industry and its revenues are no longer enough to resist the forces of the global market. The International Monetary Fund predicts an 8 per cent economic contraction for 2016; the inflation rate is now the fastest in the world; electricity and running water are luxuries. Food and medicine are scarce. The Chavista regime would have to move to restrict the law of value and replace the capitalist mode of production in order to end the rule of global market. That would require the state monopoly of foreign trade; expropriation of the food production and distribution; default on the foreign debt; expropriation of the banks and big businesses; and a national democratic plan of production. Even that would not be enough if Venezuela remained isolated without any sympathetic governments in Latin America also prepared to adopt similar measures. And token support from Cuba aside, Venezuela is isolated. China, which has loaned Caracas $65bn against future oil deliveries, is unlikely to extend fresh credit. So it is probably too late, as the forces of reaction gain ground every day in the country. It seems that we await only the decision of the army to change sides and oust the Chavistas. This entry was posted on May 31, 2016 at 10:29 am and is filed under capitalism, economics, Profitability. You can follow any responses to this entry through the RSS 2.0 feed. You can leave a response, or trackback from your own site. “vital point that Venezuela needs the support of LA governments.” Why? Look at what happened to a country as massive and naturally wealthy as the USSR when it was encircled by NATO and China! An excellent (and sobering) write-up. On this note, I would be very interested to see anything you might have to say in terms of a comparative analysis between the political economy and politics of Venezuela and Bolivia; both the PSUV and the MAS seem to be politically identical (both espouse “Bolivarian socialism” and are Marxian in orientation), but at this time at least there are obvious divergences in economic indicators. Perhaps this is rooted in differences in the natural resource base of the two national economies? Economist mark weisbrot wrote in the NATION that the problem was mainly due to the faulty exchange rate system of Venezuela.could u elaborate on the exchange rate system and why fixing it won’t be the solution ? Weisbrot has written excellently on many occasions on the situation in Venezuela but his Keynesian solution of devaluation and a ‘floating exchange rate’ won’t work. Argentina tried devaluation in its crisis of 2001 and it appeared to work for a while – but then commodity prices were on the way up and not down. And the policy did not last. Weisbrot seems to be hoping that the small recovery in the oil price this year may save the day. But a floating currency will become a sinking one in the current environment and breed even more inflation. Capital controls and state control of trade is now a necessity. Everywhere, the well-being of the working class is at the mercy of the uneven process of capital accumulation. It will remain so until the working class come to understanding of the essence of capitalist society. That is, understanding that goes beyond appearance. It is the job of the left to educate the working class. It is more than just a bit tedious to continually see ‘appearance only’ analysis. Many on the left, quite obviously, require deeper understanding of Marx. That is true only if the capitalist mode of production and the law of value dominates and is allowed to. Michael, take a few thousand words (++) to expand on this and you may be a wee bit nearer to assisting the working class. Michael, a scientific definition of ‘the law of value’ would be a start. And, while you are at it, a scientific definition of what exactly ‘an economy’ is in capitalist society. Please don’t mention GDP or any other such bourgeois non-sense. Socialism means social ownership and democratic control over the collective product of labour and natural resources. Attempting to run a system of commodity production, selling the product of labour in the market and then taxing profits to provide subsidised or even free public, health, education and welfare is leftist, but it’s not socialism. It’s a more humane form of wage-slavery, but it is not the emancipation of the working class from the wage system. One BIG reason why the workers remain politically ignorant about what socialism or its interchangeable equivalent, communism, means is the more or less constant use of the term to describe left-wing forms of the wage system. I suppose communists could use a different term to describe a classless democracy where production for use was the rule and the distribution of wealth on the basis of need was the norm. But then, we’d have another problem in the fact that socialism and communism were used by Marx and Engels to describe the change in the mode of producing and distributing wealth and they were and remain the most articulate spokesmen for developing the class consciousness necessary for the self- emancipation of the wage-slaves. It seems to me that Jim Drysdale is offering the best approach to the dilemma. Odd that you phrase the problem as being declining demand, given your opposition to that argument by Keynesians. Odd also because, in fact, the demand for oil and other primary products has continued to rise over the last decade. The sharp drop in prices has been caused by significant overproduction, not a lack of demand. The charts for copper oil and other primary products shows a huge rises in prices from around 1999/2000 when the new long wave boom started, and as I predicted 4-5 years ago, the new production which those higher prices and profits generated, on the back of that increased demand, would on the basis of previous long wave cycles take until around 2013 to come fully on stream, at which point an oversupply would occur. That is what has happened. A look at the cycle for copper prices in previous long wave cycles, also suggests that it would take around 2 years for the oversupply to work itself out, at which point the lower market prices due to forced selling ends, but market prices remain lower than the previous peaks because, a) the undersupply is corrected, by the new production, and b) as Marx describes in TOSV 2, in his discussion of the theories of rent of Malthus, West Ricardo and Anderson, it is always the case that in extractive industries, it is only after the additional cost of additional capital investment has been absorbed, that the effect of lower values, from the new production becomes manifest, and that takes around 10-12 years, according to Marx. That is why 2 years ago, I wrote that the oil price would possibly spike down to $25, and that this year was likely to move between $40-70, before settling at a new longer run equilibrium price of around $80, as the new price of production. The movements of primary product prices, particularly copper have followed the pattern of every other long wave cycle. It can be seen in copper, iron ore, oil, and agricultural products. They remained low during the Winter phase from 1987-1999, which led to a lack of investment in new supply. They spiked in around 2000, as the sharp rise in demand from the start of the new Spring phase meant that this previous, old costly supply could not respond adequately. It prompted large scale investment, for example in the development of new mines in Central Asia, Latin America, and Africa. All of that new supply came on stream around the time of the start of the Summer phase of the cycle in 2012, and caused an oversupply, which then depressed prices. On the basis of previous long wave cycles, I would expect primary product prices to stabilise from their current positions, and to rise modestly over the next 12-15 years of the Summer phase of the cycle, as global demand rises, but not as sharply as in the Spring phase, and as this new more efficient, lower value production is able to meet it. The other consequence as Marx describes in his analysis of rent in Capital III, and TOSV 2, is that the potential for rent is likely to decline on this new production, as a result of the lower value of this new production. It means that all those regimes such as Saudi Arabia, Venezuela, Russia, and economies like Scotland, Norway and so on, which relied on rents from the surplus profits of these extractive industries will see their revenues decline. As I pointed out, a while ago, that means that those economies that enjoyed these rents, and funnelled them back into global money markets, so causing global interest rates to decline, will become net borrowers from those markets, as they seek to finance their state spending. Already it can be seen that Saudi Arabia and other Gulf states have become significant borrowers of money-capital rather than significant suppliers of money-capital. Not only has Saudi Arabia issued several new bonds amounting to several billion dollars, but it is proposing borrowing money-capital by selling shares in Saudi Aramco, which is reckoned to have a potential share value of $2 trillion. Again, as Marx sets out in Capital III, discussing the relation of the interest rate cycle to the industrial cycle, this is again quite typical. As I pointed out in 2013, this would result in a rise in global interest rates, as the ability of firms to finance capital accumulation from profits declines, as profits begin to get squeezed by rising wages, and yet require additional money-capital to finance expansion as the rise in wages, and larger workforce causes demand for wage goods to rise. In addition, for a similar reason, states as recipients of revenues in the form of interest and rents, find them declining and have to borrow money-capital to finance their state spending. Consequently, the rising demand for money-capital, relative to its supply causes interest rates to rise. That is why, as Marx sets out in Capital III, it is during such periods that financial asset prices tend to fall, as a result of the effect on the capitalised value of revenues. As I pointed out a while ago, a look at previous cycles, suggests that we will see stock, bond and property markets decline in real terms for the next 25-30 years, for that reason. Yes, the current period is the result of overproduction, and overproduction is what determines the decline in profitability leading to the “decline in demand.” China’s imports have fallen pretty steadily over the last 12 months, as have exports. I think that qualifies as a decline in demand. From February 2016:”“whereby extensive accumulation leads to labour supplies being used up, productivity growth slows, wages are pushed up, and consequently profits begin to get squeezed starts to occur. During this phase, as Marx describes, these processes begin to mean that the demand for money-capital starts to outstrip the supply for both the above reasons, so interest rates start to rise, and this rise in interest rates causes the capitalised prices of financial assets to fall. A similar period where demand for money capital outstrips supply? Which is why central banks have instituted negative interest rates, right? Isn’t this about politics rather than overproduction? There isn’t too much oil in the market going unsold but simply oil being sold at lower prices because someone in an oil producing nation took a supply decision. So Saudi Arabia is hoping its low cost oil production will put pressure on the high cost producers. Admittedly this is partly in response to US shale gas production. I am also wondering how your prediction of a modest rise in the price of primary products squares with your prediction of a fall in stock market values. Won’t an increase in the price of primary products cause stock market values to rise, given the weightings? It is overproduction. The apologists for capitalism, who never want to see the possibility of such overproduction, and so talk about under consumption, refer to falls in demand for primary products but there has been no such drop in demand, other than for a few products, for short periods. The apologists try to obfuscate by talking about falling Chinese demand, and yes, China is a major consumer of primary products, but it far from being the only consumer of primary products, and globally the demand has continued to rise, by around 2% p.a. for oil and so on. The cause of the overproduction is the fact that large amounts of investment was put into shale production in the US, and the development of new wells across the globe. It isn’t that Saudi has significantly increased production, but that as this other supply has come on the market – for example, the US recovered its old position as largest oil producer – Saudi has maintained its own production. On primary product prices and stock market valuations, you have to understand what the basis of the prices of fictitious capital is. It is the process of capitalisation that Marx describes in Capital III. If we take a piece of land, for example. Land has no value, because it is not the product of labour, and so it also has no price of production, which can act as the “natural price” around which the market price revolves. As Marx describes, this is the same as with capital, which also has no value, because its use value, the ability to produce the average rate of profit, is also not the product of labour, which is why it also has no price of production, and so no “natural rate of interest”, around which the average rate of interest revolves. The price of land, is determined by the capitalised rent. If the annual rent for a piece of land is £1,000, and the average rate of interest is 5%, the price of land, is its capitalised rent which is 1000 x 100/5 = £20,000. Put another way, to achieve the £1,000 rent, at an average rate of interest of 5%, you would need £20,000 of loanable money-capital. That applies also to bonds and shares. So, the capitalised prices of these assets is affected by two factors, one the revenue they currently produce, and two the average rate of interest. What Marx shows in Capital III, is that during periods when interest rates are rising, this usually is more decisive than any rise in revenue, and so capitalised prices of such assets fall. Moreover, in times when interest rates start from a low level, the change can be more exaggerated. For example, if interest rates rose from 5% to 6%, the value of the land above, falls from £20,000 to £16,666. If interest rates were originally at 1%, the value of the land would have been £100,000, and a rise of one percentage point this time, from 1% to 2%, causes the capitalised value of the land to halve, from £100,000 to £50,000! So, in a period when interest rates have started from historically low levels, driven by the high levels of loanable money-capital thrown into global markets from the late 1980’s onwards, as the rate of profit rose sharply, producing increasing amounts of realised money profits, that means that relatively small rises in the average rate of interest have large implications for the capitalised prices of these fictitious assets. A rise from 1% to just 1.25%, for example, would cause a £100,000 asset value to drop to £80,000. That is why central banks have tried to prop up these fictitious capital prices as global market rates of interest have started to rise, by lowering official interest rates, and introducing measures of QE, to buy up various financial assets using QE. In fact, its amazing how bourgeois economists who denounce the idea that prices can be determined by the state, are quite happy to have us believe that the state can determine the price of money-capital by diktat. Of course all the state can do by such measures, and QE is to affect the prices of certain assets that it buys, and encourages others to buy. But, as Marx sets out in Capital III, not only is the actual rate of interest determined by the demand and supply of money-capital in the market, not by the actions of central banks, but as he points out in another context, it is impossible to remedy a problem of overproduction and falling prices, by having the central bank buy up the excess. One reason that interest rates were low over the previous period was that part of the rise in profits after about 1987, was that it was also manifest in the surplus profits obtained by oil producers, in the form of rents. Countries like Saudi or Norway, could not use up all of the rents from oil production they received, and so channelled those funds into sovereign wealth funds, which bought up global financial assets, i.e. existing stocks and bonds, pushing the market prices of those assets ever higher, and simultaneously, thereby reducing the yield on them. The fall in the oil price has ended that position, so the flow of those rents into global capital markets of money-capital slows down. In fact, Saudi Arabia is issuing bonds itself, as are other gulf producers, and if it sells a large quantity of shares in Saudi Aramco, that will be a big drain on existing liquidity in those capital markets, pushing up the demand for money-capital relative to supply, and thereby pushing interest rates higher. As Marx points out, the owners of loanable money-capital are no more concerned what the buyer wants it for than is the supplier of any other commodity. Whether the borrower wants the money-capital to expand their business, to finance a lavish lifestyle, or to cover their necessary expenses, the lender of the money-capital will demand the market rate of interest. In fact, as Marx sets out, the rate of interest reaches its highest level during a crisis, because firms find that their profits decline, and payments to them slow down or fail to materialise so they lack liquidity. At that point, firms needing to stay afloat, and to make their own payments, demand money-capital not to expand, but simply to pay their bills, and as he says, they are prepared to pay almost any rate of interest to do so during such times. So, we now have a period, as I set out three years ago, where profits start to get squeezed because labour markets have started to tighten across the globe, and that is pushing up wages, lowering the rate of surplus value, especially as productivity growth has slowed to a trickle. The basis of rising stock prices is either that profits, and the potential for higher dividends are rising significantly, or that interest rates are falling. But, profits are not rising significantly, as they start to get squeezed by rising wages, and interest rates are rising globally not falling, despite the attempts of central banks to manipulate the price of money-capital. Interest rates are rising for the reasons Marx describes. As realised money profits even stop rising so rapidly, the surplus money-capital that firms throw into money markets declines, and their demand for money-capital whether to expand, to pay bills, or simply to cover rising expenses, increases. At the same time, the demand for money-capital is rising from states too – for example, in Saudi Arabia, but the IMF and OECD are now saying that states need to engage in significant fiscal expansion. Just in terms of basic infrastructure required for the efficient functioning of modern capitalist economies that is needed. With interest rates rising only marginally from previously very low levels, that represents a large percentage increase in interest rates, as the above examples demonstrate. That is happening at a time when profits are only growing more modestly, and when, as Andy Haldane has shown, the proportion of profits being paid as dividends has already risen from around 10% in the 1970’s, to around 70% today. So, rising interest rates will more than offset any potential rise in profits or dividends, and will thereby cause the capitalised prices of fictitious capital to fall. Moreover, as Marx sets out in Capital III, Chapter 6 and elsewhere, the rate of profit moves inversely to the price of raw materials. As the price of oil, copper and so on stabilises and starts to rise, that may boost the profits of oil companies, though not necessarily significantly, given the huge surplus profits that were being made prior to the falls in price, but that will be more than offset by the fall in the rate of profit that implies for every other company that uses oil or oil derivative products, or other primary products in one form or another. Given that that includes pretty much every other company, including service industries, it necessarily reduces the rate of profit. Moreover, as recent data indicate, it impacts inflation, with a consequent effect on wages, and the rate of profit. It also affects future real returns on bonds etc., so that their current value gets written down, with a consequent effect on other financial assets. The bourgeois economists and bankers today as in Marx’s time do not understand the difference between money and money tokens, or between money and money-capital. They believe that the rate of interest is determined by the demand and supply for money, rather than money-capital, and consequently they think that they can reduce interest rates by simply printing more money tokens. Marx describes in A Contribution to the Critique of Political Economy, and in Theories of Surplus Value, and in Capital III, why that idea is nonsense. If more money tokens are created by printing money that does not increase the amount of money, but only depreciates the value of the tokens representing that money. In so doing, as Marx points out, quoting Hume and Massie, it simply changes the standard of measurement on either side of the equation of the demand and supply for money-capital, and so leaves the rate of interest unchanged. All that QE does is to goose the prices of those assets bought by the central bank, and thereby distorts all other prices. It reduces yields on some assets only to result in higher yields on assets elsewhere in the global economy, a fact seen in the export of large amounts of US currency to various countries like China. Many of the new technologies developed from the 1970’s/80’s, that formed the base technologies that drove the period of intensive accumulation during the 1980’s and 90’s, have now become mature, and we have entered a period where extensive accumulation is more predominant than intensive accumulation, which is one reason that productivity is slowing. The excess supplies of labour that resulted from new areas of the globe becoming industrialised, and that flowed from the creation of relative surplus population from the rises in productivity brought about by the introduction of new technologies have started to be used up. A lot of the capital accumulation taking place is of circulating capital of materials, and given the significance now of service industries, of labour-power, whilst previous fixed capital investment is now being exploited more intensively. For example, all of the fixed capital investment in communications systems can be utilised to a far greater extent without any significant additional fixed capital investment. So wages are rising and the wage share is also rising as more workers are employed on these higher wages. Realised money profits growth is slowing, whilst the demand for money-capital is rising to cover these additional costs, and because firms are able to finance less from their own profits. A range of states that benefitted from high rents, interest payments (countries like Saudi and Norway, earned large revenues on their global investments, in spite of low yields, as they are able to invest less in such financial assets, their revenues will fall, even as yields rise) and taxes, now find that situation reversing, and to cover their spending they need to become borrowers, again increasing the demand for money-capital relative to the supply. The consequence is rising global interest rates, and that means falling financial asset prices. In short, the Venezuelan government should have recreated in Venezuela a repetition of the economics of the old Soviet Union. Street protests, opposition newspapers, trouble-making political opponents were never a problem there. Socialism had the near-unanimous support of the population, as shown by the fact that in elections, the Communist Party received around 99% of the vote. You’ve set up your straw man and knocked it down doug congratulations. It doesn’t change the fact that Chavez had 15 years to cure Venezuela of the Dutch disease and he failed. Hello, Michael. Great post you wrote here. As a Latin American, I’m very conscious about the awful consecuences of an economy dependent on the export of raw materials. Although my country (Peru) isn’t doing as bas as Venezuela, we’re cleary heading into a political and economic crisis. Peruvian economy depends greatly on mineral exports to China, which have shrunk considerably recently. Now, the social tensions generated by the huge growth of inequality and the inability to create a decent middle class, which were contained by the hope of economic growth reaching the poor in the future, are threatening to explode. Given that the actual problem can be related to the failure of the industrialization process of the mid-20th century, I’m very interested in understanding the causes of its failure. Do you think you could do a post explaining the Latin American debt crisis from a marxist perspective? I’ve never liked the prevailing narrative because it puts the blame on excessive government intervention which led to excessive borrowing. But, like all bourgeois explanations, it’s very superficial and probably doesn’t go to the underlying causes. Was it really a fault of the governments’ policy or had the law of value something to do with it? I really hope you address this topic someday. Thank you! In my opinion such measures as monopoly, expropiation, default, national democratic plan of production … they are the same as in Cuba and North Korea. They didn’t work there precisely. Moreover the chavistas do not seem very democratic people and they consitute a corrupt regime. They should not be defended by so called marxists. How the hell can you be so disconnected from almost all economic research undergone in the past 50 years, the nature of politicians, people and political science, the reality of communism and isolationism, the nature of global agriculture, the inescapable nature of markets etc. etc. etc? I’d expect this to be written in 1917, not 2016. You, sir, make economics seem like a joke and make people think economists are blathering idiots that can’t agree on a thing. @Ben – The only one disconnected from reality is mostly likely you because you take the given capitalist mode of production and the horrible consequences of its continuing crises as a given reality, free from all criticism and change. You haven’t provided anything substantial as to why the paragraphs is a “joke”, only sheer disgust. This isn’t criticism or an argument, but simply prejudice. As a matter of fact, there is a plethora of blathering idiots who call themselves economists, and most of them fall into the camp of mainstream economy which is so ideologically bound to “reality” it cannot see the wood for the trees, nor do they have any interest in pushing society out of the mess of the global depression. How mainstream economy dealt with global recession in 2008 and how they managed to push entire nations down due to the catastrophic policies of austerity measures speak volumes as to their ineptitude and class interests. Economists are also, in fact, even more likely to disagree on “a thing”, as the recession of 2008-2009 demonstrated – the majority have not only failed to explain what caused the crisis (they are rather delving into particularities and triggers), but were even rewarded for being “blathering idiots”, meaning economists are paid not to provide any meaningful economic forecasts that would benefit society. You have Keynesians, post-Keynesians, mainstream economists, Austrian school of economics, and then there is the rare intelligent species of Michael Roberts who is a Marxist … so, even at first glance, it is obvious to everyone who is even remotely interested in economy that the science and people who dwell in it “can’t agree on a thing”. Mr. Roberts is simply suggesting a radical departure from the economy which takes capitalist mode of production for granted and true for all eternity; in your infamour paragraph, he is providing a radical socialist solution. I suggest you read his latest book The Long Depression to see the inevitable quagmire capitalism has managed to produce for the entire world, and especially how Marx’s labour theory of value plus his theory of profitability come into play here. Then maybe you’ll see that the only “inescapability of markets” is the reality in which capitalism reigns supreme, unchallanged and immutable since the dawn of mankind. Capitalism is not a perfect system, I never said it was, and I don’t class myself as some ultra libertarian that has their head in the clouds when it comes to the realities of markets (I’m more of a centrist). But, that doesn’t mean that state-control of the means of production, especially in a more undeveloped economy is the way to go at all. The policies he is advocating like defaulted on foreign debts would stop any foreign investment or capital flowing into the country altogether, it would cause bank runs and massive currency depreciation which would make Venezuela even poorer. Also, the complete ignorance of any sort of property rights which would cause unrest or a revolution and even if it was successful, it would make agriculture far less productive which would make the country poorer, more indebted and ultimately, cause more people dying or become malnourished. Expropriation of big businesses is already happening and some of the most talented and productive people in the country (business owners) are getting thrown in jail while the business either collapses or gets heavily unionised which makes the government even less solvent and completely halts any foreign or domestic investment. The socialist and Marxist policies of Chávez are directly leading to the deaths of thousands of people and plunging a country into fundamental poverty, how can you not see that and want more of the same? Markets are, fundamentally inescapable. Every civilisation in the history of the world has had to deal with market forces. Countries that try and escape them fall into utter poverty and/or totalitarianism. On austerity, of course it was devastating. But, in Greece it was caused initially by the Euro (which caused a Greek bond bubble) and an incompetent socialist Greek government that overspent. Of course Germany could’ve done much more and not impose devastating harmful policies that few economists agreed with, but it was caused by governments, not by capitalism. And, even after going through one of the worst Depressions of any country in the post-industrial era, Greece is still richer than North Korea or Venezuela). And countless economists try to get us out of this ‘Long Depression’ every day, it is the most pressing issue in Macroeconomics. But, governments and central banks often aren’t listening. The Fed is tightening when they’re not reaching their inflation target, the Euro has barely been reformed even though it’s a ticking time bomb, Greece is still in a Depression and an entire generation of Greeks are being left unemployed, Germany is running a massive budget and current account surplus at the expense of everyone else, governments are not reforming their tight overregulated economies and labour markets, governments are cutting spending when demand is weak and central banks aren’t even considering other options to deal with the zero lower bound problem when the next recession hits that could easily lead to a Depression because of lack of monetary stimulus and incompetent governments. But, that does not mean that capitalism is a failure. A smaller percentage of people live in absolute poverty than at any time in the history of the human population and it’s still falling, fewer people are dying in conflicts than ever before, we may live in a ‘depression’ now, but it followed the fastest period of growth in middle-income economies in history (around 1995-2007) which expanded the global middle class massively and was mostly down to free trade policies and the rapid expansion of the WTO and more capitalist economies like in Western Europe and North America are substantially more productive and wealthier than ex-communist nations. Also, countries that are reducing government intervention and increasing personal freedom etc are, on the whole, becoming wealthier. There is a million and one pieces of evidence that this holds true and Marxist economists seem to dismiss it or ignore it while supplying no historical evidence that their ideology or ideas even work. And even in a purely ideological, emotional and non-economic sense, do you not see that personal freedom is a good thing? Living in a developed free first world country (the UK) and reading a lot of history, I see I’m immensely lucky to be so free. Completely free to pursue the career of my choice, be with the person I choose, write what I want to write, vote for who I want and ultimately live the life I want to live. In order to have state control of the means of production and develop a stable and workable society, it’s highly unlikely you’ll have any of them as the majority is highly unlikely to ever vote for such a system (the possible exception is after living under extremely poor conditions and terrible leaders like in Tsarist Russia which essentially nobody lives under today). Absolutely power corrupts absolutely and all that. Marxists seem unable to appreciate that – that in their society, their ‘opponents’ are highly likely to be censored in order to maintain the government. I, too, would love to live in a world where a completely rational, neutral and just government controlled everything and where no one exploited the system by using collectivisation to their individual advantage at the expense of everyone else. Where everyone was paid by the wealth they created and not exploited by capitalists yet capitalists still innovated the way they do to increase productivity to keep us wealthy. While everyone was given the freedoms enjoyed in today’s Western societies. I’d also like to win £100m on the lottery on Saturday. But, none of these are ever going to happen, which is why the world has (mostly) moved past Marxism. Bloody hell, have I written a lot for an internet comment. And I meant Maduro, not Chávez. Most of your ideological beliefs in the eternity of capitalism have been dismantled by Marxists (if you actually bother with Marx’s third volume of Capital, Theories of Surplus Value, and Grundrisse) like Michael Roberts and, obviously enough, by the reality of global recession of 2008-2009. I will not even bother with your primitive notion of freedom, as it was already reduced to idiotic metaphysics by German philosophers of the 18th century (without economic freedom human beings are simply unconscious pawns of social forces). As I said, read up on his latest book The Long Depression, the forecast for the majority of people who don’t live in an ivory tower is not looking good. Major wars were the only true efficient means of overcoming two great major crises in the history of capitalism (the only effective means to get rid of dead “constant” capital) and it seems this is what the savage nature of your beloved “free market” world is planning for society in the upcoming decades. Marxists do in fact study history, especially how capitalism resolves its crises at the expense of the working class, but are simply not blinded by the rosy-tinted successes of capitalism by denying the horrible consequences of progress, paved by global wars, constant recessions and depressions, immiseration of the population (especially the Middle East and the so-called third world), and the rising inequality. As Marx noted, capitalism’s success is paved by blood, and liberals who are stuck with the idyllic notions of capitalism tend to forget that. And what they also tend to forget is that capitalism is tethered to history, to time, meaning there was a time when it was a major progressive force in the history of humanity, but has ceased playing that role in the 21st century. Mr Roberts adamantly demonstrates that capitalism has for decades now mostly focused on speculation, not on developing productive forces, it has become a useless system of accummulation of private wealth and financial engineering, it is squandering billions of dollars monthly for the sake of preserving the status quo of private property of the means of production and private distribution of wealth. When the financial engineering of Goldman Sachs impoverish millions, then the system which supports such savage acts of money-making is to be discarded. And the only thing that the mainstream economists post-recession have proved is that capitalism will do anything to preserve the savagery of Goldman Sachs, even if it means continuing the brutal and destructive politics of austerity measures … Greek workers would indeed like to have a word with you on your blind faith in capitalim. Marxists seem to love criticising capitalism but always avoid defending their own policies. I’d love to see a Marxist seriously defend the idea of default on foreign debts on purpose or for a corrupt government to expropriate private land or nationalise agriculture. From an American or Western perspective, those forecasts may hold true and there are a variety of policies that economists are advocating that aren’t nearly as extreme as Marxism. The world is of course more than just the West, and global inequality has fallen in the past two decades from free trade. Even just focusing on the poorest countries in the world that are stagnating, it is almost always down to bad government institutions and blatant corruption. More government in those countries would not in a million years fix that. And even the 2007-9 financial crisis does not at all dismantle the idea that capitalism can’t be successful. It was, ultimately, a failure of institutions: the federal funds rate went from just 1% to 5.25% in 2 years which coincided with the abrupt halt to rising property prices in the US and then, when the system collapsed rates were lowered too late and the Wicksellian equilibrium rate was pushed deep into negative territory yet the Fed let inflation fall into negative territory because of its failure to adopt a inflation target and the absurd belief of the Fed that 0% was the optimal inflation rate at all times. And that doesn’t even mention the astronomical failures of the European Central Bank. Or Fannie Mae and Freddie Mac being sponsored by the Federal government, and pushed and influenced by the Bush administration to increase home ownership. Or, of course, the failure to regulate the financial industry. Now, of course capitalism has problems. Private investment is a fundamental problem which is why the vast majority of economists seem to support increases in government- funded investment. However, if capitalism is paved with blood or not a progressive force anymore, why has the global life expectancy boomed to unprecedented levels? Why has infant mortality fell dramatically? Why have deaths in conflict fallen? Why has global inequality fell since the expansion of free trade in the late 90s? If the world is so much worse under capitalism, why doesn’t data ever show it?